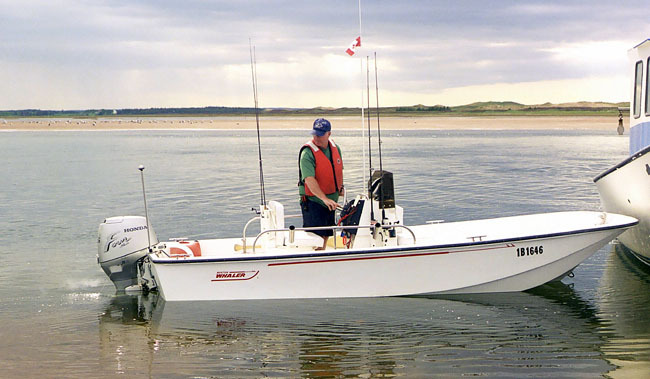 While the Boston Whaler Montauk is the most common model built on the 16/17-foot hull, it is not the only model available in that length hull. Here are some 16/17-foot Whalers that didn't leave the factory as Montauks. "I have enjoyed your web site for some time now. 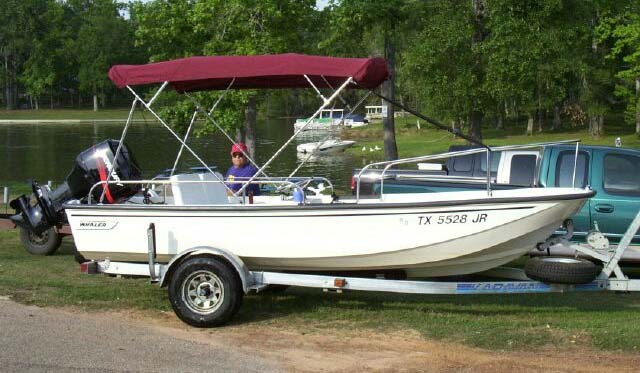 I have a Boston Whaler 17-Standard. I don't recall seeing one on continuousWave. "I admit that I over did the Bimini a bit. It was necessary to please my wife. I use 1/4-inch Sampson braid cross bracing and shock cord to stabilize the rig. While it looks like a spider's web, it holds the top frame firm in a chop. It is easily removed, as is the front bench. It was my intention to keep it simple. The boat is pulling day-cruise and sight-seeing duty only these days as we have a 9-month-old daughter. It will be ready when the day comes to go fishing though. We live on Lake Conroe in South East Texas and we make the occasional trip to South Mississippi." 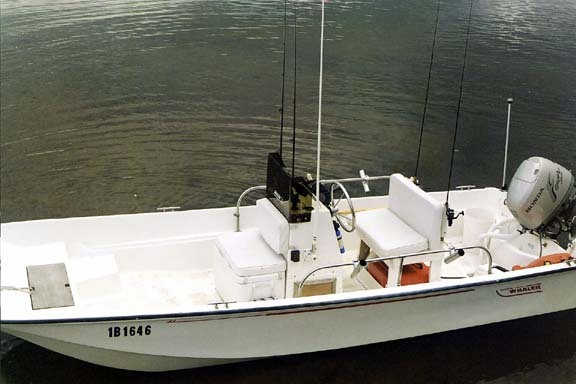 This 1999 Boston Whaler 17-Standard was an alternative to the Montauk model. It has a small side console and simple thwart seating. It's powered by a 1999 Mercury 90-HP engine. The back end of the cockpit is filled with twin coolers, twin tanks, and a battery. The classic hull design has no problem carrying this load. 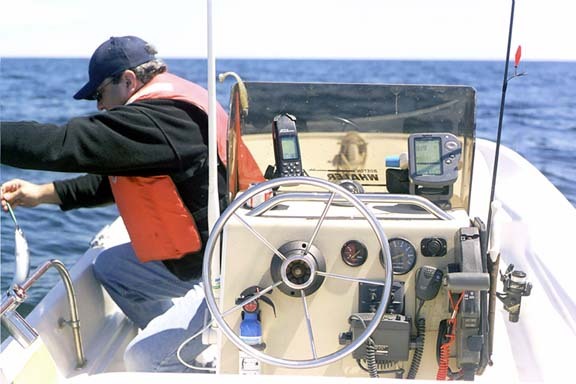 That's a Standard Horizon DS35 Digital Depth Sounder on the console; the transducer is on the transom under the swim platform. The ice chests are retained by saddles fashioned from WhaleBoard®. Eventually the rear of the cockpit will be covered with WhaleBoard® top resting on the molded hull lip with a custom gas tank located underneath. 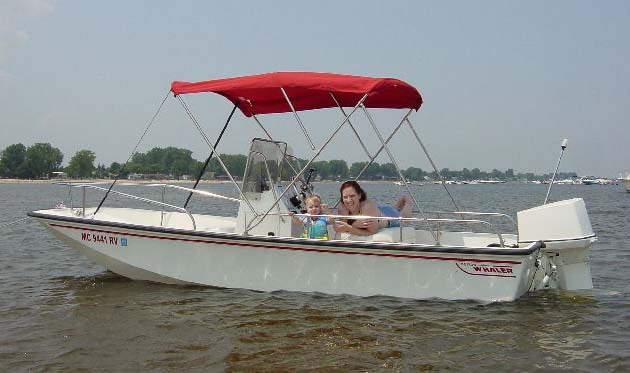 It seems that just about any boat built by Whaler that came with simple thwart seating gets upgraded by the owner. Here more comfortable upholstered seats with backs have been added, a pair of "Helmsman folding seats" by Garelick. The sun top was made by a local canvas shop with stainless steel frame and Sunbrella fabric. "My Whaler experience started in 1979 when I was 9 years old. My dad bought a 1976 13-footer with a 40-HP Evinrude. We punished that boat and it still survives. I always knew I had to have one of my own. "I purchased a bare hull 1999 17-Standard with no options new in the spring of 1999 and built a 'Montauk' of my own. "I have kept track of my costs and can say that I have spent about one-third the cost of a similarly equipped Montauk boat, motor, and trailer. Keeping costs that low does have sacrifices, though. I'm running a 1977 Johnson outboard that I rebuilt, and I invested a lot of time into the whole thing. My biggest success in keeping costs down involved a whole lot of luck. I found most of my hardware by shopping marine surplus and salvage yards in Florida during several vacations there. The best source was the annual Dania Marine Flea Market held once a year just north of Miami. Over 900 vendors of marine salvage and surplus for everything boating come together for four days each year. Yes, if you dig through enough junk, even Whaler fittings and hardware can be found. "A couple of examples of luck: I found an original, never-used Montauk fiberglass center console at a marine surplus yard near Tampa. Someone had just brought it in a few hours before I arrived. I paid $140.00 for it. The price new from my Whaler dealer was about $1200.00. I found a used bow rail, missing a couple of pieces, that I paid $42.00. I made the missing pieces and made the side rails with a custom bender I built. I have about $200.00 into all railings which would normally be $1100-1200. "The Dania Marine Flea Market is definitely worth the trip. I think it is around early April each year. I was like a kid in a candy store. I ran out of money long before I ran out of deals. It is the only way to put together a boat. "I want to thank you for the fantastic web site. I've learned a lot from the vast experience of all the participants. It was very useful for me to reference the site as I assembled my boat." A 17-Standard bare hull was the basis for this custom built Whaler. Steve Klein bought a new hull and outfitted it with a variety of surplus components to create his own Montuak. He saved quite a bit of money in the process, too! One deviation from original: the bow railing height has been lowered about 6-7 inches, which increased their rigidity quite a bit. Steve is sort of swimming against the current with his 1977 Johnson engine on a 1999 Whaler hull. Usually it is the other way around: the hull is 22-years old and the outboard motor is brand new. "Hello Jim, I was going to wait until the boat was perfect but I have had it in the water since July 16, 2001 and can't wait any longer to send you pics. 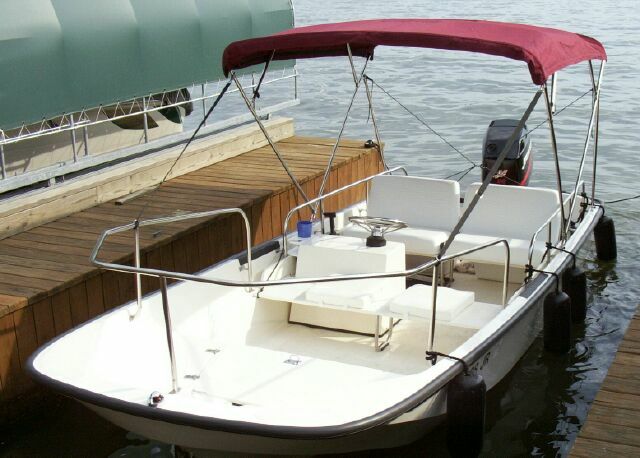 "To rebuild the boat I used 7 gallons of WEST System epoxy resin and 205 and 206 hardeners, and 40-yards of mat and cloth. And four sheets of plywood! Two sheets for the floor and two sheets for bulkheads placed 16-inches apart and two stringers that run the length of the floor. The hull was reinforced with two gallons of epoxy and three layers of mat before the bulkheads and stringers were sealed and glassed into the hull with epoxy. All spaces between the hull and floor were filled with polyurathane foam board and air spaces were filled with liquid foam--one of the worst parts of the five-month job. The floor was epoxied and screwed into the bulkheads, stringers and lip from the old fiberglass floor. The floor was held in place with sand bags until the epoxy set. The floor was then covered with a layer of mat and cloth and epoxy and filler. The non-skid has an international flavor. I put beach sand from Daytona Beach in the paint and it worked great. 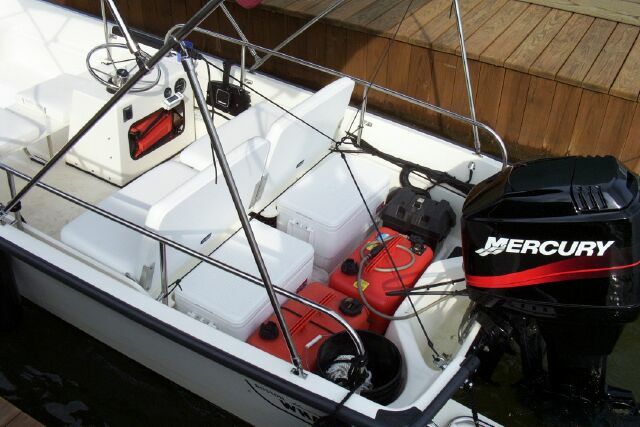 "The boat has a wide-open-throttle speed of 29 MPH with the 45 HP Honda 4-stroke and an 11 X 12 prop. "All the best, Jim, and thanks again for printing the first pics on Page 30." "Me and my 1966 Whaler. I didn't place the console as far foreward as on a Montauk. I thought that it would give a softer ride." 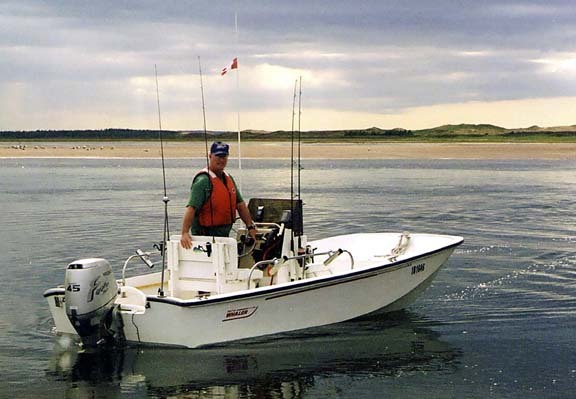 "Fishin' buddy Rob and the Whaler on a glide-on trailer. The trailer has plastic covered bunks and plastic coated frames. The boat just slides off---easier than a [floppy] roller trailer." "No room for radar on a boat this size. 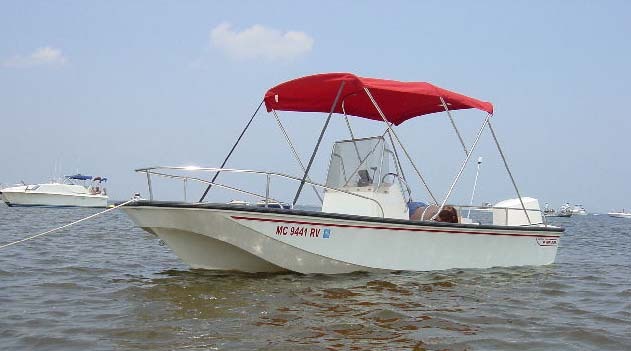 My plans are to add a 2-4 HP 4-stroke kicker and a hand held VHF in case I ever lose power for the console mounted RAY45 VHF." "A little more detail of the boat and floor." 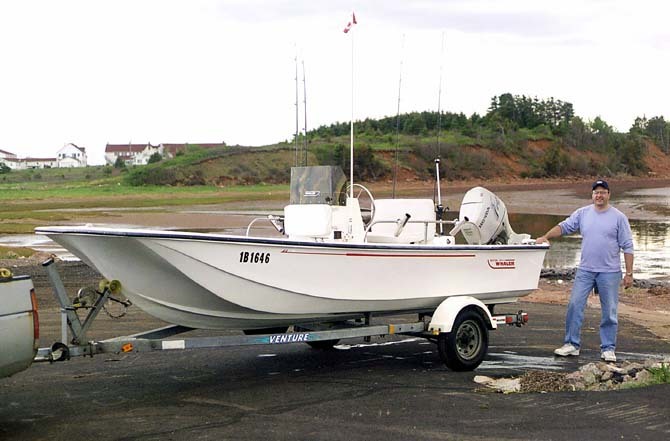 David and his reborn 1966 Whaler, ready for fishing off beaches of Prince Edward Island. Unusual currents make for some of the warmest water on the Atlantic coast. The page has been accessed 60362 times.